If I were to summarize day one of my AT thru-hike in one word, I would say “rough”. I woke up around 4:20 AM, shared a teary goodbye with my parents, and arrived at the airport for my 7:45 flight to Atlanta. While I’ve flown a lot in the past few years for various client projects for my job, walking through the airport this time felt new. I didn’t get much sleep the night before and was too nervous to eat any breakfast. After the two hour flight, I met my partner for this adventure, Matt Carson (“Carsoni”) at baggage claim and we made our way out to meet our shuttle driver, Ron Brown. Ron was a character. 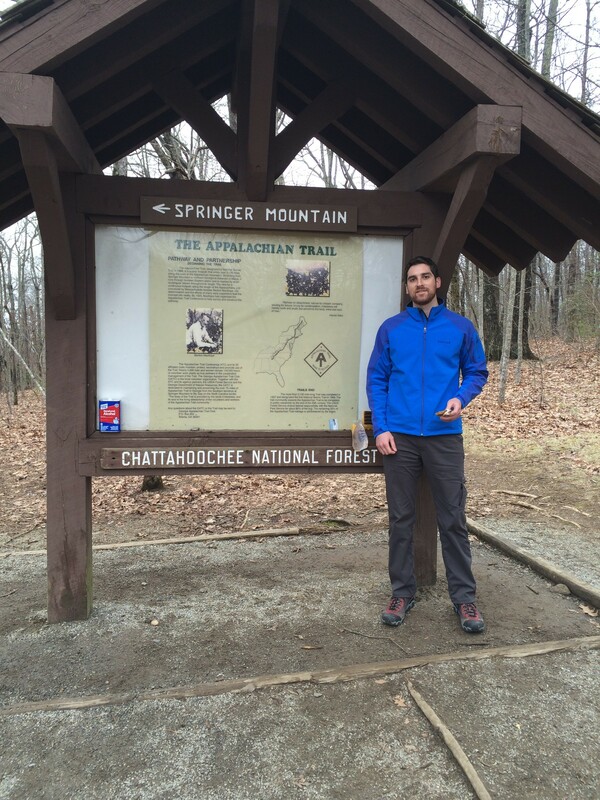 He had plenty of interesting (read: terrifying) stories to share about the trail and had a GPS device he called “Mr. Nightmare” that had the voice of some sort of demon. “Turn left up ahead, if you dare.” Needless to say, my nerves were not eased at this point. 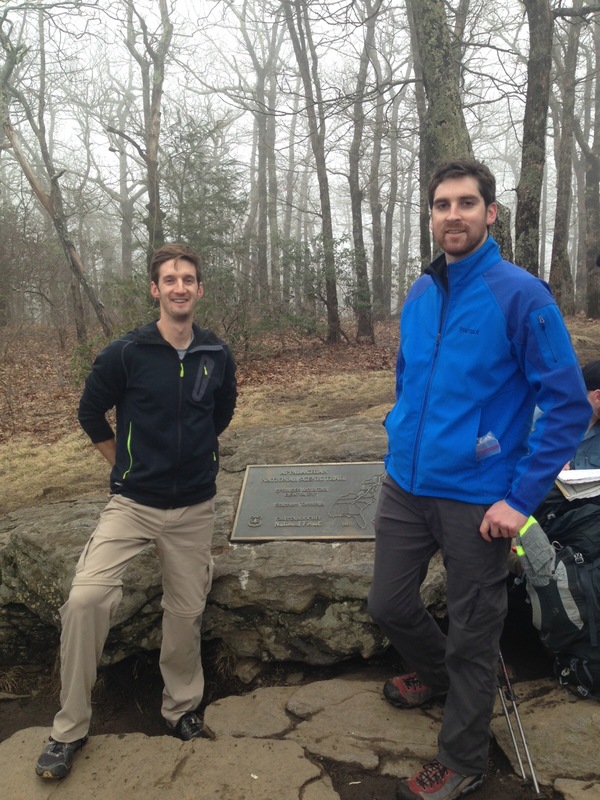 Carsoni and I shared the shuttle with two other thru-hikers who had arranged for Ron to drive them to Big Stamp Gap one mile north of the official start of the AT on the peak of Springer Mountain. Carsoni and I decided to join them instead of going to the AT Approach Trail as planned. By doing this, we skipped the 8.8 mile climb up to Springer. While I had always planned on hiking this part, I can say now that I am happy with my decision. When we eventually got to Big Stamp, said goodbye to Ron and his demon, we were ready to start this adventure. Ron had assured us that the one mile climb up to Springer was not bad at all. While that may be true relative to what lies ahead of us, this one mile climb with 30 lbs of weight on my back seemed to take hours. My lack of sleep and food left me without energy and feeling lightheaded. When we finally reached the summit, I had to tear off my bag and take a seat for 10 minutes. This iconic start of the AT atop Springer Mountain was a much smaller area than I had imagined and the clouds blocked the great view I had heard about. 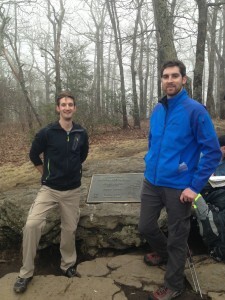 There were about 10 people up there, one of whom took a ceremonial photo of Carsoni and me at the Springer Mountain plaque. After a brief respite, we strapped our packs back on and headed back the way we came, headed north. While this part was a decline and much easier, I still wasn’t feeling much better. 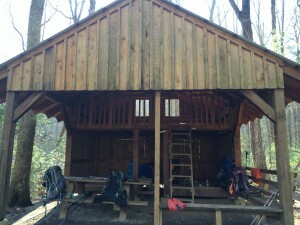 I told Carsoni I needed to stop at the next shelter for the night, Stover Creek shelter. When we arrived, the shelter and the camping areas were pretty full with about 40 other hikers. Carsoni and I set up our tents, made some introductions, and then I needed to lie down. It was only about 5 o’clock, but I was spent. The camaraderie with fellow hikers was something I was really looking forward to about this trip, but tonight I just needed to put my ear plugs in and lay down. I curled inside my sleeping bag and stayed there for the next few hours. I’ll be honest and tell you that a few times today the idea of quitting seemed like a great decision, if only for a moment. But as I type this on my iPhone in my tent in the middle of the woods at one AM, I can honestly say that I am excited to see what tomorrow holds. I’m sure many thru-hikers second guess their decision to undertake this crazy journey, especially during the first few weeks, but it wouldn’t be such a great achievement if it was just a walk in the woods. Oh wait. Greetings. My name is Steve Gallagher. I am 30 years old and I will be thru hiking the AT starting in March 2014. I chose this rather unflattering profile picture because it represents the last time I accomplished a seemingly impossible goal: finishing a marathon. While running 26.2 miles once seemed impossible, spending the next 5-6 months hiking through 2,200 miles of mountainous woods from Georgia to Maine is unimaginable. It will be a true test for me, but one that I am excited to undertake. Hope you will follow along on my adventure.